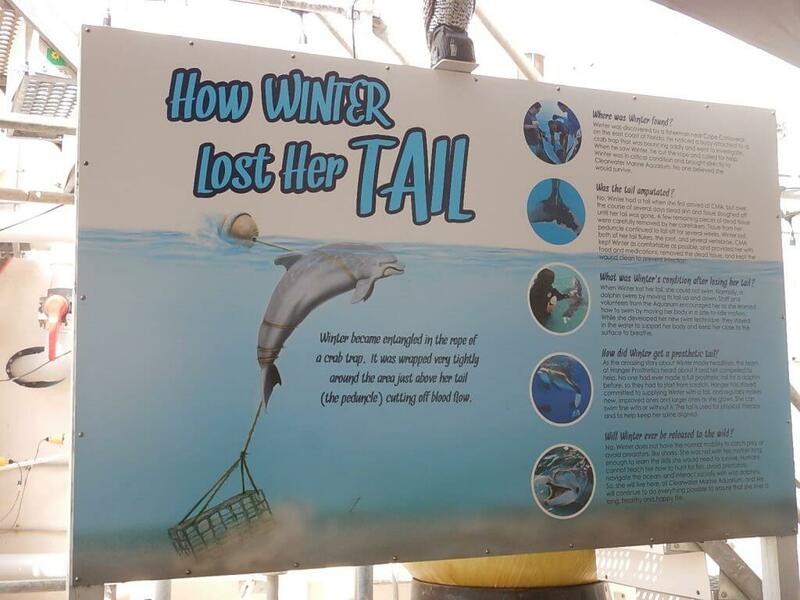 If you’ve seen the movie A Dolphin Tale, or maybe even if you haven’t, you’ll have heard of Winter the dolphin. The movie is based on the real life story of the 2-month old dolphin who was rescued off the coast of Florida after becoming entangled in a crab trap line. She sustained such severe injuries to her tail that it couldn’t be saved, and rescuers assumed she wouldn’t survive much longer. Despite the odds, Winter not only survived, but thrived, going on to inspire people across the world to overcome seemingly impossible obstacles. She learned to swim without her tail, although if you’ve seen the movie, you know that a prosthetic tail was made for her. 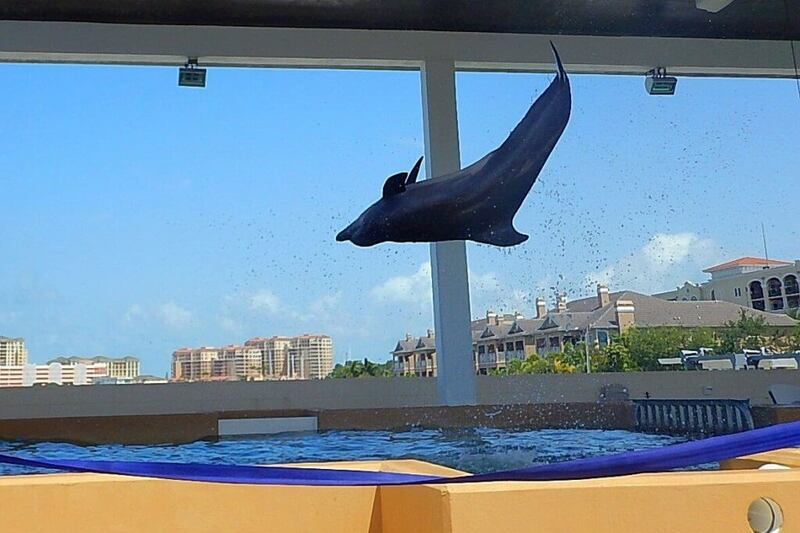 Winter is now 11 years old, and is living out the rest of her days in comfort at the Clearwater Marine Aquarium. It’s rare to hear a tale like this and be able to visit the animal in question, so after watching the movie a few weeks ago, Harrison was beyond excited to learn that Winter lived just a few hours from us in Clearwater, Florida. We decided to use Memorial Day to go and visit her and her aquarium buddies, and had a fantastic day! 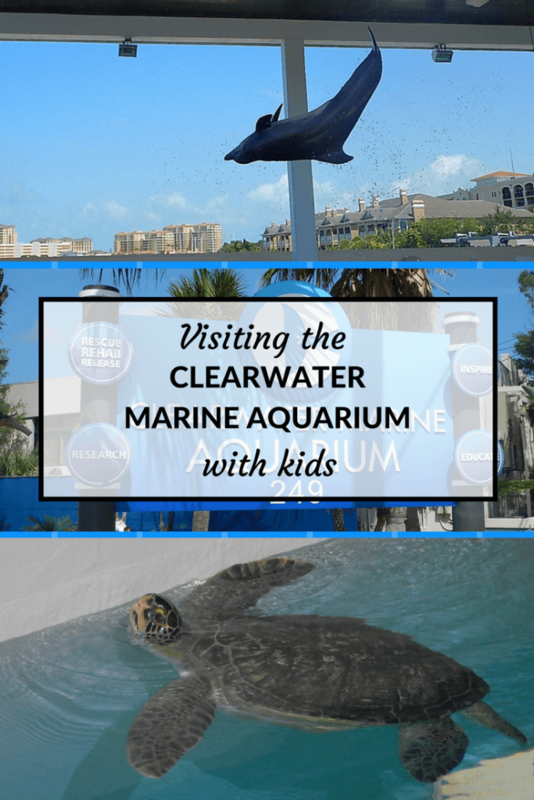 Here’s what you’ll need to know about visiting Clearwater Marine Aquarium with kids. 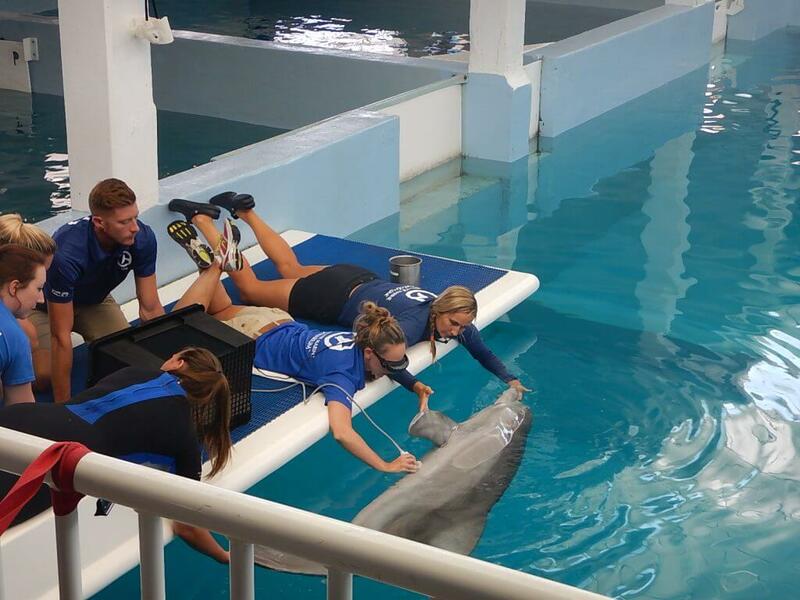 Clearwater Marine Aquarium is located on the west coast of Florida, a little under two hours from Central Florida. The drive from the Orlando area is an easy one on I-4 West, and once you hit the Tampa area, there are some spectacular bridges to drive over! Excluding holidays like Thanksgiving and Christmas, the aquarium is open every day (you can find their hours here) and tickets can be bought online in advance or at the door. Parking is in a neighboring garage, and is $6 a day for aquarium visitors. The website suggests planning to spend 2-3 hours at the aquarium and, visiting with a 4-year old and a 14-month old, that time seemed about perfect to us – although I’d imagine if you had older kids, especially those interested in working with marine animals in the future, you could easily spend more time there. The wristband they give you when you purchase your tickets is good for the whole day, so you can leave to hit the beach or get some lunch, and then come back later. There is a small snack bar selling mostly things like popcorn, ice cream, candy, and cold drinks (although they do have pizza by the slice, and some deli wraps too) and the prices were very reasonable. The website also suggests the Island Way Grill (a restaurant within walking distance) for dinner, and we had the most amazing fresh seafood there before beginning our drive back to Orlando. The one challenge we did have was bringing the stroller; if you can avoid doing so, then I would recommend leaving the stroller at home! With a 14-month old who is still unsteady on his feet and hates a baby carrier, it was necessary for us, but it was a bit of a pain. Some of the walkways were quite narrow and the viewing areas got crowded, meaning it was hard to navigate a stroller through. There is an elevator that we used with no problems, but it would have been so much easier to use the steps. There is a stroller parking location just outside the aquarium, and we ended up leaving the stroller there for about 30 minutes while I carried Grayson, and this worked really well. Leaving a stroller there is completely at your own risk, so bear that in mind, but I leave my stroller unattended at Walt Disney World all the time so I was comfortable doing that! Clearwater Marine Aquarium isn’t your typical aquarium with rows of glass tanks with hundreds of species of fish. The animals here were all rescued, and while the goal of a rescued animal is always for them to be rehabilitated and returned to the wild, sometimes it’s just not possible. The residents at the aquarium include a number of animals, but the stars here are of course Winter and her friends, Hope and Nicholas. The aquarium sits on two levels, with the lower level providing underwater viewing, and the upper level dedicated to viewing the tanks from above. We were able to see both Winter and her companion, Hope, in both the underwater viewing locations and from up above in the Winter Zone. It really was amazing to see Winter swimming and playing with her toys with such an obvious injury, but truly heartwarming at the same time. Her companion, Hope, was rescued as a very young calf too, and was deemed to be too young to release back into the wild. There are hourly presentations and educational talks at the aquarium, and a couple of them focus on these two dolphins. The talks are entertaining and informative, and Harrison was fascinated! He has repeated what he learned about Winter to anyone who will listen, and is amazed at what she can do without her tail. The other Clearwater Marine Aquarium dolphin resident is Nicholas, who we were able to see on the Stranding Deck at one of the trainer talks. Nicholas was also rescued as a very young calf, and is now a permanent resident at the aquarium. The trainer talk was the highlight of Harrison’s day, as the trainer went into great detail about Nicholas and why he couldn’t be released back in the wild, as well as what she did to take care of him and what she was teaching him. It was amazing to hear about everything that had been done to save him and nurse him back to health, and I went away with a huge amount of respect for those involved with caring for these animals. Harrison was riveted for the whole talk, and loved watching Nicholas performing some of the tricks he loved to show off! If you want to see this talk – and I highly recommend it – get there early, as there aren’t many seats in the shade, and it does get hot up there. Depending on your child and their sensitivity level, I would also caution that the tales of what has happened to the dolphins are really quite sad, especially when their mothers have died or humans have been the cause of their injuries; I can imagine some children getting upset with that information – Harrison found it hard to hear of baby dolphins left without mommies to take care of them. Some of the other Clearwater Marine Aquarium permanent residents include otters, turtles, sharks and stingrays. 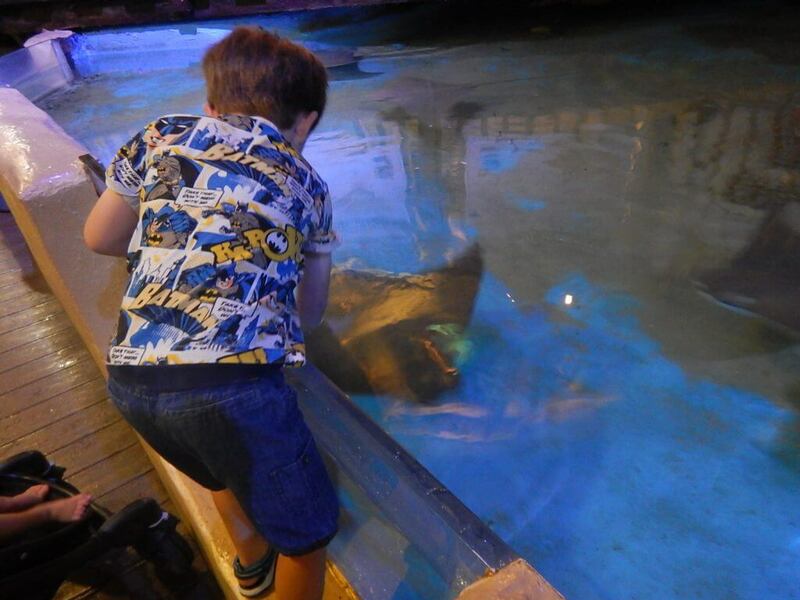 The stingrays were a huge hit with Harrison, as you could reach into the tank to (gently!) touch them, and they seemed to enjoy splashing those at the edge of the tank! Harrison also loved the turtles, but my favorite were the otters; we watched a presentation at Otter Oasis with one of the resident otters, Walle, and it was amazing to see how much he seemed to be enjoying his training! 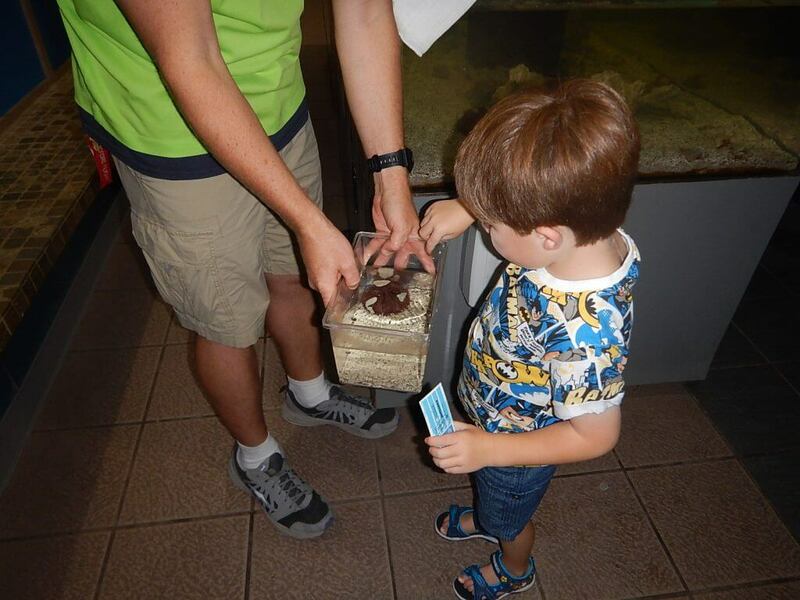 If you’ve seen A Dolphin Tale, you would also recognize Rufus the pelican; Harrison was so excited to see him, and loved that he was there to see! As well as the animals who call the Clearwater Marine Aquarium home full time, there are a number that are just passing through. 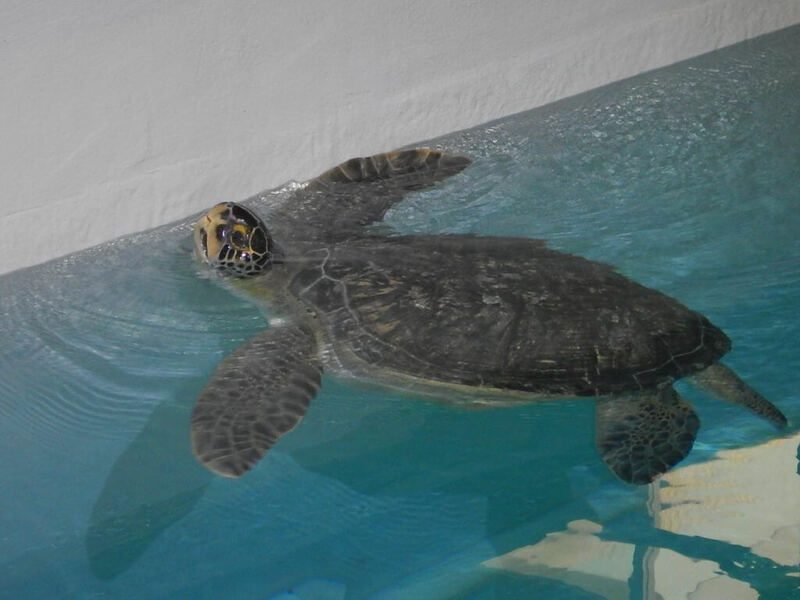 Several turtles were being rehabilitated in the animal hospital while we there, and this area is open to the public. It was wonderful to see the animals being cared for, knowing that they were going to make it back out to the wild one day. Harrison didn’t understand why the animals wouldn’t just live there forever since, in his mind, they were safer there than in the wild, and a fantastic employee explained to him why release back into the wild was always the goal. This was a really wonderful lesson for him, and I think it took the sting a little out of the sad stories of animals who couldn’t be saved, knowing that those he saw were going to be released back to where they belong. The Spectrum Theater is right off the entrance, and I’d recommend starting out here, as you can learn all about the aquarium and the backstory to Winter if you’re unfamiliar with it. 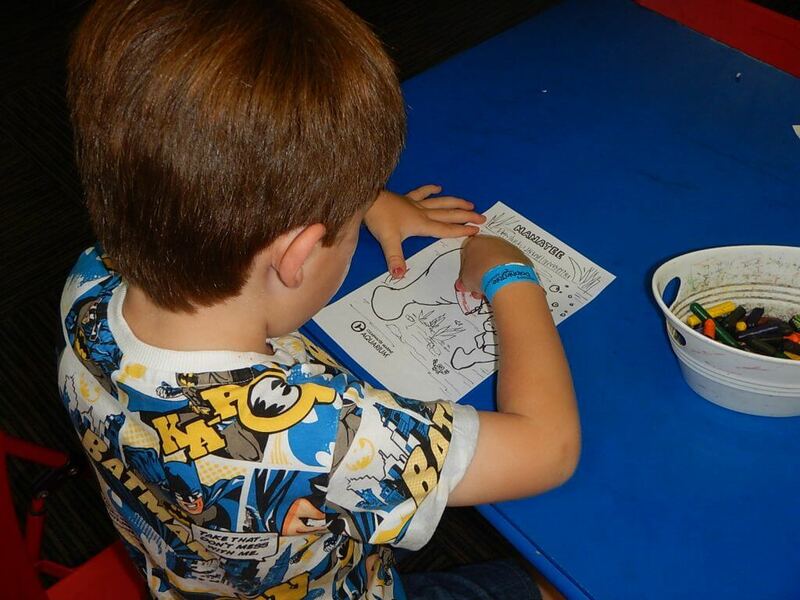 There is also an Education Center with movies about Winter and the other residents, as well as a room where the kids could color, and learn more about the residents. The gift shop is right at the entrance and exit, so good luck getting in and out without buying anything – we came home with a t-shirt, a rescue boat and of course, a stuffed Winter the dolphin! There are a number of other optional activities that you can book in advance, such as boat tours, kayaking, dolphin encounters, and more. Take a look at the Clearwater Marine Aquarium official website before your trip to see if there is anything you would like to do, and be sure to look at the age limits for each activity; we had planned on a boat tour that we later discovered didn’t allow kids under three, so we had to skip it. I have a long list of things we want to try next time though! Clearwater is a beautiful beach town, and nearby St Petersburg is a tourist haven. If you’re just coming to Clearwater for the day, visiting the aquarium may be enough to keep you busy, especially when you factor in driving from where you’re staying. However, if you stay for longer, or just want to pack more into your day, the beaches in Clearwater are beautiful; think soft white sand, calm waters, and plenty of facilities. We visited Sand Key Park, which had plenty of parking, bathrooms, picnic areas, and kids play grounds. 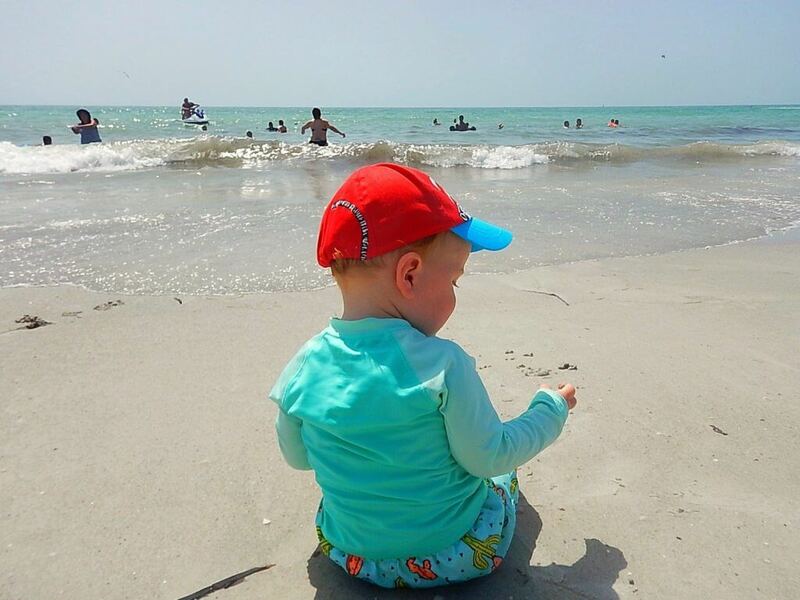 Read more on taking a baby to the beach in my guide here. 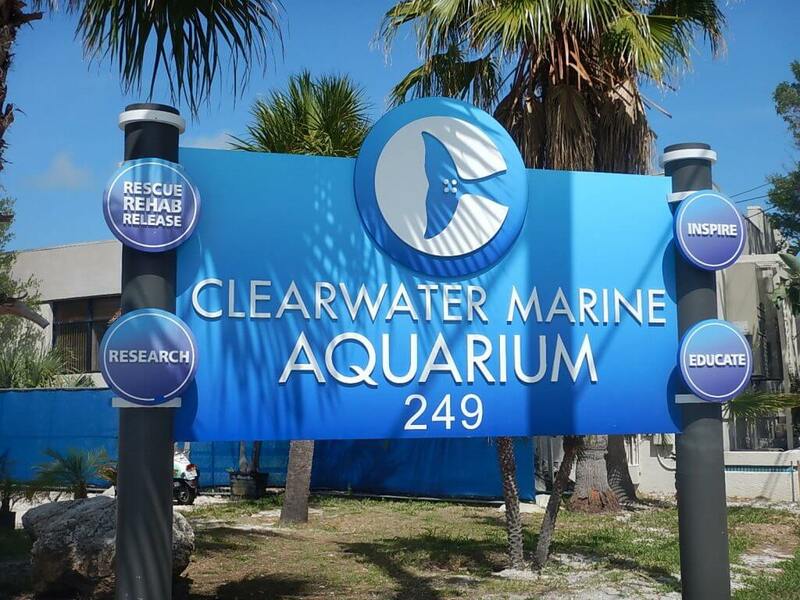 Have you visited the Clearwater Marine Aquarium? What was your favorite thing to do? Let me know in the comments! What a fun aquarium! I have some family that loves in Sarasota which I think is pretty close to Clearwater. Hopefully if we make it down that way soon we can take some time to visit this place! Thanks for sharing it! Yes, Sarasota is only about 30 minutes from Clearwater! The aquarium is lovely, and it was so nice to hear about the animals that had been rescued. I bet your son would love it! I love clearwater, the beach there is so beautiful and there are awesome places to get food and drinks on the beach. BUT I have never been to this aquarium. NOR have a seen the movie actually! Really?! It’s on Netflix! I would definitely recommend the aquarium, it was only about a 10 minute drive from the beach. We wanted to try Clearwater beach but it was Memorial Day and it was soooooo crowded! We went to Sand Key Park instead and found it to be much quieter. Hopefully we’ll make it to Clearwater beach another time! We are hopeingbto head to Clearwater beach in may 2018. We can’t wait to see the aquarium! How exciting, lucky you! Clearwater beach is such a lovely beach, and the area surrounding it has so much to do. The aquarium is absolutely fantastic, we could easily have spent the whole day there! The work they do is really wonderful.